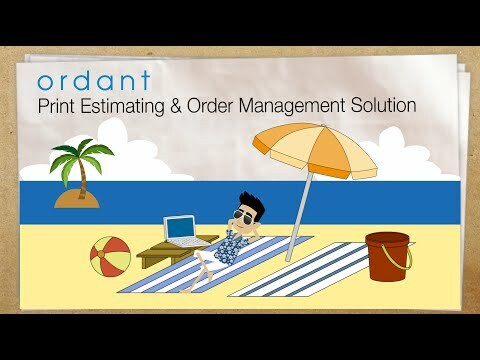 Ordant is an advanced print estimating and order management platform (print MIS) with an integrated web-to-print system for both B2C and B2B storefronts. The solution enables print companies and sign shops to calculate the precise cost of their custom projects, and includes features such as online purchase orders, CRM, proofing, and file upload. Ordant’s web-to-print storefront enables customers to calculate complex estimates and place orders online, as well as look up order history, upload files, and track order progress. Organizations can create and select custom formulas for pricing, with markups for an unlimited number of products and options. Online proofing features allow users to send a PDF version to customers via email for real-time comments, approvals, or rejections. Users can setup custom fields to update status, and track the progress of all orders in a single view using touch screen, drag & drop functionality. The system sends an email notification once a customer approves an order, and automatically transfers it into the job queue. The purchase order module enables users to add a list of vendors and the items they offer, along with their prices. Users can create a new RFQ (request for quotation) for a vendor from any order/estimate, or enter custom items. The PO can be sent to the vendor, complete with status tracking functionality. Over the past few years our print & graphic design business has been rapidly growing. This growth caused us not only to expand the amount of print and finishing equipment we have, but also created the need for a print MIS solution. Prior to Ordant’s software, my business was using a 100% hand written work order system for pricing and tracking of all our print production jobs. The system worked, but as we continued to grow, we ran in to more and more issues. It was time consuming, inconsistent and worst of all provided no way to retain crucial details about our print customers and the products they were ordering. I began looking around online for a print MIS application that would allow my business to grow and thrive in the world of print. Every option I looked in to had very little customization options and was extremely complicated to use. They came with loads and loads of features that my business would never use. I really needed something that my entire print staff could easily understand and use on a day-to-day basis. Ordant’s print MIS software has become an integral part of my print and graphic design business. Customer support and his team took care of all the initial set-up and responds almost immediately to any phone call or email we send. Ordant has become the perfect complement to our print and finishing equipment. I now feel my business has the final piece needed to reach our full potential in the world of print.When I came across Ordant’s website, I immediately liked what I saw…. “Ordant Print Estimating & Order Management… Simplified.” This one-line statement described almost EXACTLY what I was looking for. I began reading over the information on the website and the more I read, the more I liked what I saw. I reached out to Ordant and was immediately connected with customer support. Support team walked me through all the different features of Ordant. He even scheduled a live on-screen demonstration of the software. Ordant was exactly what I’d been looking for. It’s a very straight forward, very user-friendly cloud-based software package that can handle all aspects of print job price estimates and workflow management. Best of all, support agent explained that the Ordant software came in a few different “package” level options. Some more basic and some more robust. He explained that Ordant can customize a specific software package with whichever add-on modules the customer needs or doesn’t need. When I came across Ordant’s website, I immediately liked what I saw…. “Ordant Print Estimating & Order Management… Simplified.” This one-line statement described almost EXACTLY what I was looking for. I began reading over the information on the website and the more I read, the more I liked what I saw. I reached out to Ordant and was immediately connected with customer support. Support team walked me through all the different features of Ordant. He even scheduled a live on-screen demonstration of the software. Ordant was exactly what I’d been looking for. It’s a very straight forward, very user-friendly cloud-based software package that can handle all aspects of print job price estimates and workflow management. Best of all, support agent explained that the Ordant software came in a few different “package” level options. Some more basic and some more robust. He explained that Ordant can customize a specific software package with whichever add-on modules the customer needs or doesn’t need. Absolutely nothing. Everything about Ordant has exceeded my expectations thus far. Before using Ordant, our workflow was deeply flawed. Each step in the process was separate from the previous, from RFQs, and Estimates, to Orders and Billing. There was a lot of double, sometimes triple entry of items. Once we switched over to Ordant, things improved immediately. The time it took to get a job in and out through Ordant was about 1/3 of what it was. The transition was really great. We were able to test and demo the system for a few months before going live that way everybody could be trained and address any issues. They entered all the pricing from our previous system for us. Once we went live, we still encountered some needed changes and training in some situations, but nothing that couldn't be quickly resolved. The support team was extremely helpful and responsive. For wide-format, we strongly felt that Ordant was a fantastic solution. Orders that were done with outside vendors could be taken care of using Purchase Orders, especially digital printing orders. Updating pricing on items was easy. Adding retail products was a breeze. The only thing that felt a bit cumbersome was anything that needed to be done offset via vendor. The Order Manager was especially helpful as a Dashboard showing where in progress each order was in production, whether the order was out for a proof, or being cut and finished. Updating an order's status via the Order Manager was as simple as drag and drop. Billing was a whole lot easier since Ordant connects to Quickbooks Desktop and Online (we used Online). Orders came through already entered and all we had to do was choose the right Chart Account for each order and it was done. The ability of Ordant being able to connect to popular SaaS offerings was helpful too. We used the Google Apps for Work suite, and Slack, and it connected seamlessly with them. This helped with file management since all our files could easily be save in the cloud for back-up. Overall, Ordant was very adaptive, intuitive, and scalable. I would highly recommend any printer looking to make their production process straightforward, hassle free, and secure should consider getting Ordant.VERY intuitive. Easy to get up and running. Fantastic support. VERY intuitive. Easy to get up and running. Fantastic support. Constantly being developed, so there are some bugs. But that means it only gets better. No software out there is perfect. Very easy to use and the Ordant team is constantly adding new features. Ease of Use: Ordant is very easy to use and has multiple routes to get to any information you need. Their team are constantly thinking of ways to improve on that and welcome customer suggestions. Customer Service: The customer service is beyond 5-Star. They reply to any questions or emails almost immediately and even have a feedback button built right into the website. If we ever come across an issue they're on it instantly to make sure we can keep the shop running smoothly. Feature & Functionality: Ordant has a ton of useful features and they're always working on new features to expand on that. They make sure to notify us of upcoming releases ahead of time so we can plan for marketing those new features to our customers. Value: At first we were a little skeptical since it is a huge investment of not only money but time. The Ordant staff were very accommodating in getting our products and pricing over into Ordant and right there if we needed any assistance. We've had the system for about 6 months now and I can't imagine the shop without it. It saves us an enormous amount of time for quoting alone, not counting the benefit for order tracking, online storefront, client history, and integrated shipping. We will occasionally find bugs but if we do they're immediately on it to get us corrected and running smoothly again. Our experience with Ordant has been one of the best customer service experiences we have had in ANY industry! Switching software is a big deal, monumental when it affects every aspect and every person in your company. We knew the process wouldn't happen overnight and that it would come with it's own set of challenges regardless of the company we went with but I must say that with the help of Ali and his team, it has been a much smoother transition than I thought it would be. We are a small company and in the middle of a growth phase so I don't have a lot of extra time for a big build out or downtime and I need a software that allows us to do more with less (an objective every business owner is after). Ordant delivers. Due to it's integrated estimating, proofing, and invoicing we have cut our front end process in half and have much improved the communication between departments. This is one of the best business investments we have made to date.Ordant allows us to do more with less (an objective every business owner is after). Due to it's integrated estimating, proofing, and invoicing we have cut our front end process in half and have much improved the communication between departments. Ordant allows us to do more with less (an objective every business owner is after). Due to it's integrated estimating, proofing, and invoicing we have cut our front end process in half and have much improved the communication between departments. I have nothing negative to say. Anything that I mention to the executive and his team they work on and have already thought of. These guys are at the top of their game! So easy to learn, so easy to get up and running. I would unhesitatingly recommend this product to others. We were able to get up and running with Ordant incredibly fast, and transitioned from our previous application with very few issues. Despite the fact that our business practices do not perfectly match the client profile for Ordant, Ali was very willing to work with us to customize the software as much as possible and help us find ways to make it work for us. Our graphics and print shop staff are very pleased with how easy it is to understand and use, and the up-to-date look and functionality of the webstore is miles above what we were using before. Despite the fact that our business practices do not perfectly match the client profile for Ordant, Ali was very willing to work with us to customize the software as much as possible and help us find ways to make it work for us. Our graphics and print shop staff are very pleased with how easy it is to understand and use, and the up-to-date look and functionality of the webstore is miles above what we were using before. Although there are some issues, they are minor and come from growing pains vs. lack of focus on quality. We look forward to growing with this company. Ordant is designed to help save time by reducing the need for re-entry and enabling users to track the progress of all orders in a single view. Customers can get estimates and place their orders online, as well as track progress and view history via the web-to-print storefront module. Cloud storage enables users to upload and attach art files to all orders or estimates, and download files when necessary. Ordant offers a customizable dashboard with drag & drop widgets and a powerful search engine for optimized navigation. The cloud-based platform requires no software installation and is accessible from anywhere, and on any device. Below are some frequently asked questions for Ordant. Q. What type of pricing plans does Ordant offer? Q. Who are the typical users of Ordant? Q. What languages does Ordant support? Q. Does Ordant support mobile devices? Q. Does Ordant offer an API? No, Ordant does not have an API available. Q. What other apps does Ordant integrate with? Q. What level of support does Ordant offer?